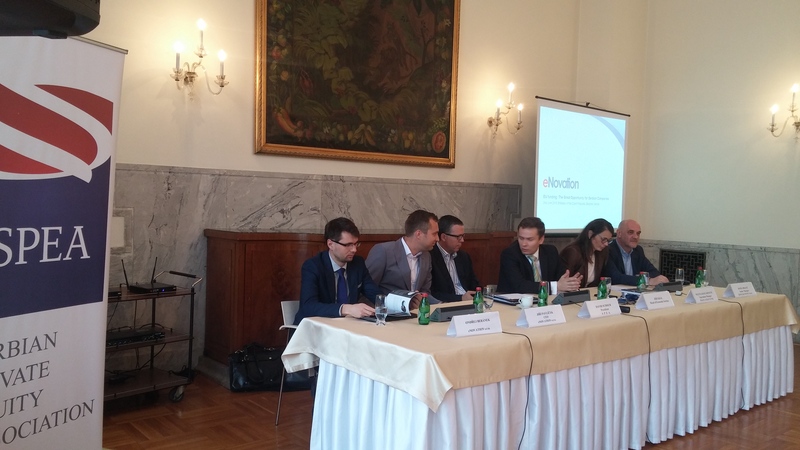 Serbian Private Equity Association (SPEA), in collaboration with eNovation and Czech Embassy in Belgrade, organized a presentation and panel discussion on successful methods Serbian companies can use when applying for EU funds. The presentation was held by Jiri Pavlicek, CEO of eNovation Ltd, who pointed out the similarities of Serbian and Czech economies and offered relevant advice on methods and procedures required from EU. Jiri Kral, Commercial Counsellor at Embassy of the Czech Republich in Belgrade, David Schoch from SPEA, Sinisa Bralic from Ernst & Young d.o.o. Beograd, Milena Kostadinovic from Innovation Fund and Ondřej Beránek from eNovation joined him in the discussion regarding challenges awaiting Serbia on its European journey. “Starting from year 2020, tens of billions of euros from EU funds will be at Serbia’s disposal, for developing agriculture, energetics, environment protection, education and many other sectors. This is why we believe it is highly important for us to take advantage of the experiences of the company which managed to successfully overcome challenges of both applicants and the state in the similar ecosystem”, stated David Schoch, president of SPEA, association which has a goal to promote best practices regarding investing on the local market. Mr Schoch has also said that this is the right moment to start preparing healthy foundations for the most efficient approach to the EU funds, not only for the benefit of the economy, but for society as whole. “Both Serbia and Czech Republic have long industrial tradition and are alike in the manner of size and number of population, which is why I believe our know-how can help Serbian companies set up effective utilization of European funds “, says Jiri Pavlicek, CEO of eNovation Ltd.
eNovation is a renowned consultancy company with a vast experience in the acquisition of public support. They are currently preparing and administering more than 440 projects with a total value in excess of 15,3 billion CZK (more than 566 million EUR)., in cooperation with public sector agencies and the largest companies in Czech Republic (like SKODA AUTO, AT&T, Zentiva – member of Sanofi Group, TPCA – Toyota Peugeot Citroën Automobile, Hyundai etc. ).